About 3,000,000 people died because of AIDS in 2004. About 500,000 of these people were children. 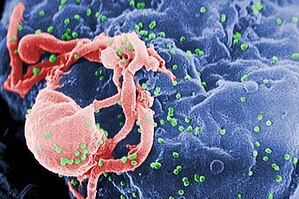 About 40,000,000 people in the world had HIV in 2004. Most of the people who have HIV live in Africa. Most of the children who die from AIDS live in Africa. Many people with HIV do not know they have it. The number of people with HIV is unknown. BLOOD, Sexual contact , pregnant woman. There is currently no vaccine or cure for HIV or AIDS. The treatment are Use condoms, medicines.